Arkansas-Little Rock: This Year's Bracket Buster? Arkansas-Little Rock: It sounds like a city name read out of order. Actually, it’s a college basketball team that could potentially be this year’s bracket buster. The Arkansas-Little Rock Trojans are a No. 12 seed, and they will play Purdue in the Round of 64 this Thursday at 4:30 p.m. ET. The 5-12 matchup has seen more upsets than any other. 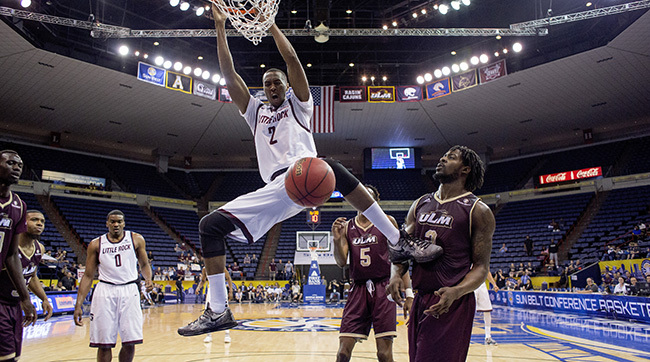 The Trojans won the Sun Belt Conference tournament Sunday by dominating University of Louisiana Monroe, 90–70. UALR finished at 29–4, one of the best records in all of Division I. (The Trojans were one of two teams in Division I to have four losses, along with Kansas.) One of those losses came against Texas Tech, which is a No. 8 seed in the tournament. Senior guard Josh Hagins leads the team with 13.1 points and 4.7 assists per game. His backcourt running mate, Marcus Johnson Jr. (12.7 ppg), is the Trojans’ most lethal scorer with a .461 three-point average. While Arkansas-Little Rock averages 71.0 points per game, what makes this team so deadly is its lockdown defense. The pesky Trojans rank third in the country in points allowed, limiting opponents to 59.9 per game. The Trojans are also by far the most improved team in college basketball after a 16-win jump from last year. Little Rock went 13–18 in 2015, the cellar dwellers of the Sun Belt. The start of this season didn’t look so bright, either, with newly hired head coach Chris Beard scrambling for players. Beard came from Division II Angelo State where he had a 47–15 record in two seasons. He was also the assistant coach at Texas Tech for 10 seasons under Bob Knight. But in his first season with Arkansas-Little Rock, he had to sign 10 players at the start of the season. All of them came from junior colleges or other Division I schools. But Beard has completely turned the Little Rock program around. In his first year, he led the Trojans to their fifth NCAA Tournament berth in school history. Arkansas-Little Rock has a balanced offense and a resilient defense, the perfect formula for a March Madness winner. Their roster also boasts mostly juniors and seniors, another asset in the tournament. The Trojans are a team that can ruin brackets — and bring the madness to a whole new level.